A heirloom gift from eric's mom and dad. 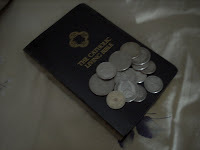 The bible used during their wedding and 13 old coins. Take note the coins are older than us. It was pressed when the Americans are still in the Philippines, the country pressed at the back of each coin states United States of America but the value is peso. Then I could just imagine if the Americans did not leave our country, we could have been just like Hawaii. i can really feel our church wedding coming soon.. few days ago we received our first wedding gifts! 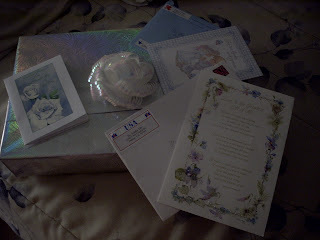 wedding cards from my mom and tita vicky and uncle steve (eric's relative) and a gift from my co-worker ate fran. kakatuwa..!!! third our chancery requirements are still not cleared... they are still asking for the certificate of freedom to marry hay naku the parish priest here in pasadena already gave us one..pero sabi ng chancery sa manila verification lang daw yun, kailangan certificate.. grabe nakakabaliw and mga requirements ng catholic church, they dont take consider na kasal na kami ni eric for 5 years... ano pang freedom to marry ang hinihingi nila... eh ever since i met this guy natali na ako sa kanya!!!! i haven't posted for quite sometime na. maybe because the stress is getting me and i just want to take things slowly... the first part of march 2007 was dedicated to my nursing board exam which i can proudly say "i passed".